There has been a significant increase in the number of individuals in the United States who practice yoga. 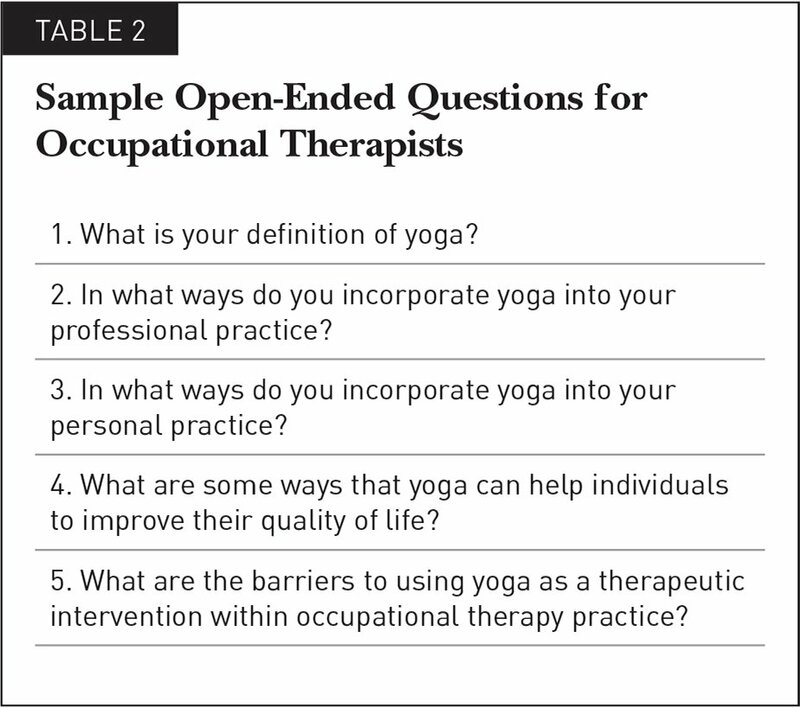 With increased knowledge of yoga, occupational therapists may be more prepared to meet the occupational needs of clients in today's evolving health care environment. This study explored phenomenological data on the perceptions of occupational therapists and yoga practitioners on the health benefits of yoga and the potential role for yoga within the scope of Western health care. A mixed-methods approach was used to collect and analyze data from anonymous online questionnaires. Participants were purposively recruited, which may limit the generalizability of the findings. Participants reported that yoga had a positive holistic influence on the functions of the body, mind, and spirit and led to increased self-awareness and favorable perceptions of well-being. Participants agreed that yoga has a role within Western health care, although there are barriers to its implementation. According to a recent survey, the number of individuals practicing yoga in the United States increased from 20.4 million in 2012 to 36 million in 2016 (Yoga Journal & Yoga Alliance, 2016). Yoga has become an integral part of modern society and continues to gain traction as an activity with widespread cultural influence (Khalsa, Telles, Cohen, & McCall, 2016). In light of the reported increase in participation in yoga, health care practitioners must be informed about the nature of yoga and the evidence of its many therapeutic effects (Woodyard, 2011). With increased knowledge about the role of yoga within health care, occupational therapy practitioners may be more able to meet the occupational needs of clients in today's evolving health care environment (Bradshaw, 2016). The American Occupational Therapy Association (AOTA) affirmed that “CHAIH [complementary health approaches and integrative health] products and practices may be used responsibly by competent occupational therapy practitioners to prepare and enhance participation and engagement by persons, groups, and populations” (American Occupational Therapy Association, 2017a, p. 1). Yoga, a mind-body form of CHAIH, is an ancient discipline designed to bring individuals physical, mental, emotional, and spiritual balance and health (Iyengar, 1979; Ross & Thomas, 2010). It is a holistic approach that has the potential to help individuals to develop the skills necessary to take responsibility for their health and wellness behaviors (Woodyard, 2011). Occupational therapy helps people across the life span to do the things they want and need to do through the therapeutic use of daily activities known as occupations (American Occupational Therapy Association, 2017b). Occupational therapy practitioners empower individuals to engage in meaningful occupations through a holistic treatment approach that is philosophically aligned with the foundations of yoga (Bradshaw, 2016). An understanding of yoga and how it can be used within the scope of occupational therapy practice can help occupational therapy practitioners to enable clients to meet their personal responsibilities, enhance their quality of life, and improve their personal sense of well-being (American Occupational Therapy Association, 2017a). Given the common holistic philosophical roots shared by occupational therapy and yoga practitioners, the exploration of potential uses of CHAIH, such as yoga, to promote occupational participation seems a natural progression. The word yoga comes from the Sanskrit verb root yuj, meaning to “to yoke, unite, or bring together” (Sovik & Bhavanani, 2016, p. 17). Yoga is the process of restoring harmony within the body-mind-spirit complex and reuniting the human spirit with its essential nature(Schweig, 2007). In Western society, yoga generally incorporates elements of exercise, breathing, and meditation; however, historically, the practice of yoga was understood to be much broader and more comprehensive, including an array of techniques to promote well-being and balance of the mind, body, and spirit (Gard, Noggle, Park, Vago, & Wilson, 2014). Within occupational therapy practice, occupation can be considered both the means and the end goal of therapy (American Occupational Therapy Association, 2014). The practice of yoga is the process of bringing union to the mind, body, and spirit. This allows the practitioner to develop internal and external balance in life, thus promoting occupational performance and participation. Yoga has been practiced for thousands of years and has been influenced by a number of classic texts, including the Vedas, Upanishads, and Bhagavad Gita (Feuerstein, 2008). Perhaps the most influential yogic text is Patanjali's Yoga Sutra, a compilation of 196 aphorisms that guide the practitioner toward self-realization (Bryant, 2009; Sovik & Bhavanani, 2016). At the heart of Patanjali's text is the message that every human being is by nature balanced and whole; thus, yoga is a method for aligning oneself with this inner balance (Bryant, 2009; Feuerstein, 2008). Patanjali recognized that imbalances in health stunted personal progress, and he approached the task of promoting good health by (a) removing obstacles that block the path to health and (b) promoting alignment with the healing forces within (Sovik & Bhavanani, 2016). He outlined an eight-limbed path that includes ethical and moral principles that offer a prescription for living a meaningful and purposeful life (Woodyard, 2011). The eight limbs include the following: yama (ethical disciplines), niyama (individual observances), asana (postures), pranayama (breath control), pratyahara (withdrawal of the senses), dharana (concentration), dhyana (meditation), and samadhi (self-realization) (Bryant, 2009; Feuerstein, 2008). Through adherence to the eight limbs, the practitioner cultivates internal and external balance in life, which leads to better overall health and well-being. A substantial amount of evidence supports the use of yoga to mitigate a number of disease-related symptoms in clinical populations (Jeter, Slutsky, Singh, & Khalsa, 2015; Salmon, Lush, Jablonski, & Sephton, 2009). From 2007 to 2017, the Cumulative Index to Nursing and Allied Health yielded 6,262 citations that included “yoga” in the title and abstract. In clinical trials, elements of yoga practice have had a positive effect on neuromuscular (Cramer et al., 2013; Evans, Tsao, Sternlieb, & Zeltzer, 2009; Galantino, Galbavy, & Quinn, 2008) and cardiorespiratory conditions (Hartley et al., 2014; Kanmanthareddy, Madan, Manchanda, & Lakkireddy, 2016). Emerging evidence suggests that yoga may be effective in treating some mental health conditions, including depression, anxiety, obsessive compulsive disorder, and sleep disorders (Balasubramaniam, Telles, & Doraiswamy, 2013; Chugh-Gupta, Baldassarre, & Vrkljan, 2013; Field, Diego, Delgado, & Medina, 2013; Kinser, Bourguignon, Whaley, Hauenstein, & Taylor, 2013). Yoga has improved various domains of quality of life through the treatment trajectory of patients living with cancer (Danhauer et al., 2009; Galantino et al., 2012). Moreover, evidence has shown that yoga improves risk factors for chronic disease, such as body weight, blood pressure, cholesterol level, and blood glucose level (Yang, 2007). Recent research has focused on how yoga equips the practitioner with the skills necessary to combat stress and how it could potentially help to prevent chronic disease (Desveaux, Lee, Goldstein, & Brooks, 2015). Yoga combines physical elements of a healthy lifestyle and strategies to influence mental function, leading to reduced stress, enhanced general well-being, and improved quality of life (Oken et al., 2006; Sharma, Gupta, & Bijlani, 2008). A growing body of research supports the hypothesis that certain yogic techniques may improve physical and mental health through downregulation of the hypothalamic-pituitary-adrenal axis and the sympathetic nervous system (Ross, Friedmann, Bevans, & Thomas, 2012). The ability to self-regulate the stress response and emotional state improves physical and mental health, disease prevention, and health promotion (Centers for Disease Control and Prevention, 2016; Ross & Michalsen, 2016). As the landscape of health care in the United States shifts from a pathological to a preventive model, it is important to identify strategies, such as yoga, that empower individuals to take control of their own health and wellness behaviors. Occupational therapy and yoga are rooted in similar holistic beliefs about unification of the mind, body, and spirit. The fundamental vision of occupational therapy is that occupation is the dynamic force that employs mind, body, and environment and that, through occupation, the mind, body, and human spirit are inextricably tied (Kielhofner, 2009). Yoga is a complete system of occupational regulation, based on complex theories that address occupational risk factors and relate occupation directly to health and well-being (Mailoo, 2005). The eight limbs outlined in Patanjali's Yoga Sutra serve as a prescription for moral and ethical conduct and self-discipline (Woodyard, 2011). Similarly, the Occupational Therapy Code of Ethics provides core values that guide AOTA members toward ethical courses of action and standards of conduct (American Occupational Therapy Association, 2015). Elements of yoga can be used within occupational therapy as preparatory methods and tasks (i.e., deep breathing, stress reduction before activities of daily living), activities (i.e., yoga poses for standing balance), and occupations (i.e., meditation for pain management) (American Occupational Therapy Association, 2017a). Occupational therapists use elements of yoga within the scope of their practice; however, the degree to which yoga is used is loosely defined, and there is no sound body of evidence to support specific uses of yoga within occupational therapy practice. Nevertheless, research is beginning to address the use of yoga within the scope of occupational therapy practice, including 34 citations in the Cumulative Index to Nursing and Allied Health database. The Merging Yoga and Occupational Therapy intervention was designed by integrating key elements of yoga and the Group Occupational Therapy for Falls protocol and has shown promise as a potential intervention to improve multiple fall-related outcomes for patients with stroke (Schmid, Van Puymbroeck, Portz, Atler, & Fruhauf, 2016). The Get Ready to Learn program, a manualized occupational therapy intervention for children with autism spectrum disorder, has shown that a 16-week program that uses yoga postures, breathing techniques, and relaxation exercises can reduce maladaptive behaviors, including irritability, lethargy, social withdrawal, hyperactivity, and noncompliance (Koenig, Buckley-Reen, & Garg, 2012). The occupational therapy practice guidelines for mental health promotion, prevention, and intervention for children and youth identify yoga as an evidence-based strategy to address physical fitness and difficult behaviors while improving self-confidence and communication skills (Bazyk & Arbesman, 2013). According to the guidelines, yoga can be used within occupational therapy practice to promote health in school, community, and health care settings. When determining whether to recommend yoga as an intervention, occupational therapy practitioners should consider individual client factors, performance patterns, and contexts to ensure that client needs are addressed (Chugh-Gupta et al., 2013). The biopsychosocial model, introduced by George Engel (1977), was created based on the premise that clinicians must attend simultaneously to the biological, psychological, and social dimensions of illness (Borrell-Carrió, Suchman, & Epstein, 2004; Ross, Bevans, Friedmann, Williams, & Thomas, 2014). The biopsychosocial model is congruent with occupational therapists' understanding of the relationship among the individual, daily activities, and the environment (Brown, 2012). Accreditation Council for Occupational Therapy Education (ACOTE) (2012) standard B.1.0 requires occupational therapy programs to include a strong foundation in the biological, physical, social, and behavioral sciences to support the understanding of occupation across the life span. Moreover, ACOTE (2012) standard B.2.9 requires occupational therapists to be able to express the quality of life, well-being, and occupations of all they serve, promoting biopsychosocial health and prevention of injury and disease while considering the context and environment (Robinson, Fisher, & Broussard, 2016). The purported action of yoga on well-being can be achieved when considered from a biopsychosocial model, whereby the individual's mind, body and social environment affect health status (Evans et al., 2009). Because of the unique ability of yoga to facilitate spiritual, physical, and psychological benefits, an increasing number of Western health care practitioners, including occupational therapists, have begun to integrate its principles into their practice (Taylor, 2012). To continue to engage health care practitioners in a dialogue about the functional use of yoga, it is important to provide evidence to support its specific biopsychosocial benefits. Many health care professionals, including occupational therapists, have little knowledge about the use of CHAIH modalities, such as yoga (Anderson, 2009; Dalmayrac, Quignon, & Baufreton, 2016). Currently, ACOTE does not require the inclusion of CHAIH content in occupational therapy curricula; however, it is the position of the AOTA that the philosophical background and the client-centered approach of the occupational therapy profession support the use of CHAIH modalities in practice (Accreditation Council for Occupational Therapy Education, 2012; American Occupational Therapy Association, 2017a; Bradshaw, 2016). Without formal education on yoga, occupational therapy educators likely gain knowledge through potentially biased or self-directed learning opportunities, such as mass media, word of mouth, the Internet, or personal experience (Bradshaw, 2016). This could lead to inconsistent awareness among new occupational therapy practitioners of the use of yoga within the ever-changing health care environment. Based on the potential for yoga to enhance engagement in occupations, the identified lack of knowledge among occupational therapists, and the position of the AOTA on the use of yoga within occupational therapy practice, this study was conducted to answer the following research questions: (a) How do occupational therapists and yoga practitioners incorporate yoga into their personal lives and professional practices? and (b) What are the perceptions of occupational therapists and yoga practitioners about the use of yoga as a self-management strategy to influence health and wellness behaviors? The study highlights the philosophy and health benefits of yoga and explores descriptive and phenomenological data on the perceptions of occupational therapists and yoga practitioners toward the incorporation of yoga into their personal and professional lives. Additionally, participants were asked to identify ways that yoga can be used as a strategy to increase self-management of health and wellness behaviors. This study used a mixed-methods design to collect phenomenological data from occupational therapists and yoga practitioners with anonymous online questionnaires. Before the study was conducted, institutional review board approval was obtained and the protocol was determined to be exempt. Participants were purposively recruited from online bulletins, forums, and social media platforms. The total number of individuals who received access to the survey was not defined because of the nature of the recruitment process. Inclusion criteria for occupational therapy practitioners included current licensure as an occupational therapist or a certified occupational therapy assistant and access to the Internet. Yoga practitioners were required to have a minimum of 5 years of experience incorporating one or more elements of Patanjali's eight limbs of yoga into their lives, current yoga practice, and access to the Internet. Participants were excluded if they could not read or understand the English language, had no Internet access, or did not meet the inclusion criteria. A letter of invitation to participate in research was posted on relevant online platforms to recruit occupational therapists and yoga practitioners. Interested participants were given a link to the appropriate online survey and asked to provide electronic consent before being directed to the survey questions. The surveys contained demographic questions that were based in part on the inclusion and exclusion criteria. Participants were guided to proceed with the study after they met the inclusion criteria. No identifiable information was provided over the course of the study. Two separate surveys consisting of 34 questions for yoga practitioners and 32 questions for occupational therapists were created with an electronic questionnaire survey system (Qualtrics). Surveys were developed by the researcher and aligned to address gaps in knowledge identified in the literature review. 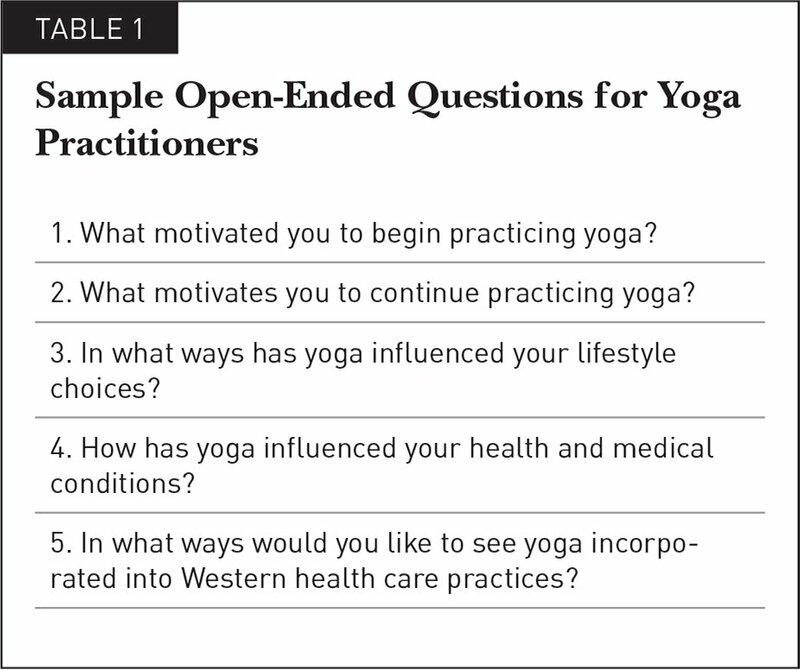 Survey questions for yoga practitioners were inspired by the findings of Ross, Friedmann, Bevans, and Thomas (2013), who investigated the health characteristics of individuals who practice yoga and the perceived effects of yoga practice on health. An additional influence was a recent study by Yoga Journal and Yoga Alliance (2016) on the current use of yoga in the United States. Survey questions for occupational therapists were inspired by the findings of Bradshaw (2016), which explored the knowledge, attitudes, and personal use of CHAIH among occupational therapy educators. A committee that included two certified yoga instructors, a licensed occupational therapy faculty mentor with in-depth knowledge of yoga, and a licensed occupational therapist who was certified as a yoga instructor and integrated movement therapist reviewed the survey questions for construct validity before administration. Table 1 and Table 2 show sample open-ended questions. Figure 1 and Figure 2 show sample quantitative questions. 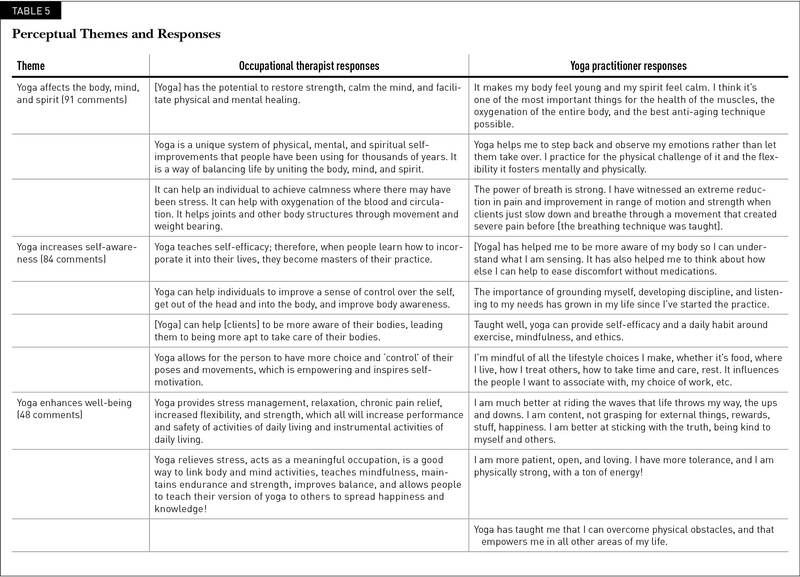 Sample dichotomous responses from yoga practitioners (n = 23). Sample dichotomous responses from occupational therapists (n = 20). Quantitative data, including responses to demographic and dichotomous yes/no questions, were comparatively analyzed. Qualitative data collected from open-ended Qualtrics survey questions were transcribed into two separate documents according to responses from occupational therapists and yoga practitioners. The transcribed information was coded into reoccurring topics, similarities, and differences with data analysis software (NVivo, version 10; QSR International). Coded information was used to identify themes and subthemes to present the qualitative results coherently. A concept matrix was also used to organize data and investigate and identify reoccurring themes to assist in the triangulation process. Data collection occurred over the course of 1 month, with a total of 23 yoga practitioners and 20 occupational therapists completing the surveys. Most of the yoga practitioners were 35 years or older (78%), female (87%), and White (83%), and had earned a master's degree or higher (57%). Most of the occupational therapists were 35 years or older (75%), female (95%), and White (90%), and had earned a master's degree or higher (75%). Table 3 and Table 4 summarize the demographic findings. Figure 1 and Figure 2 highlight responses to closed-ended questions. Most participants (90%) reported incorporating yoga into their personal life and/or professional practice, and all participants (100%) agreed that yoga was a strategy that could help individuals to better self-manage their health and wellness behaviors. After data collection and transcription, four central themes on the use of yoga were found. Participants perceived the following: (a) the practice of asana, pranayama, and dhyana positively affects the functions of the body, mind, and spirit; (b) yoga increases self-awareness; (c) yoga affects overall well-being; and (d) although there is a role for yoga in Western health care, there are barriers to its implementation within occupational therapy. Occupational therapists and yoga practitioners identified postures, breathing techniques, and meditation as strategies to improve the functions of the body-mind-spirit complex. Both occupational therapists and yoga practitioners reported that yoga increased self-awareness, including the development of self-efficacy, self-regulation, and self-care. Participants noted that the practice of yoga was motivating and elicited a sense of empowerment that resulted in positive perceptions of health-related quality of life and overall well-being. Several yoga practitioners concurred that yoga should be covered by health insurance, prescribed by medical professionals, incorporated into medical treatment, and included in school health programs. However, occupational therapists identified barriers to the use of yoga as a therapeutic intervention within occupational therapy practice, including lack of space, lack of understanding regarding how to bill for yoga-related activities, preconceived notions of clients, and complex client health conditions that limit participation. Table 5 shows highlights of the qualitative results. Participant responses suggested that the practice of yoga has biopsychosocial health benefits and leads to increased self-awareness, ultimately resulting in favorable perceptions of well-being. These observations are similar to the findings of Cramer et al. (2013), which imply that the physical practice of yoga leads to increased body awareness, creating an internal locus of control over health and an overall sense of control over well-being. A distinctive advantage of yoga is self-empowerment (Desikachar, Bragdon, & Bossart, 2005). Several participants reported feeling “empowered” in “all areas of life” and motivated “to manage their own health and wellness.” Ross et al. (2014) found that participants reported that yoga practice led to personal transformation, a sense of belonging, and a greater sense of purpose, all of which contributed to better health and wellness. Although most yoga practitioners agreed that yoga should be included in Western health care practices and several occupational therapists reported using yoga in professional practice, some participants believed that yoga and Western health care were too different to be provided in the same environment. Nonetheless, Van Puymbroeck, Miller, Dickes, and Schmid (2015) found that key agency personnel, including rehabilitation therapists, believed that yoga addressed patients' physical, social, and mental needs. Occupational therapists reported a need for more evidence to support the use of yoga in occupational therapy practice and suggested that the ACOTE standards should include CHAIH modalities, such as yoga, within occupational therapy education. Bradshaw (2016) noted that, without adequate knowledge of CHAIH and its integration with conventional medicine, occupational therapy educators may be at a disadvantage when teaching future occupational therapists about current trends in health care that include CHAIH. Small positive changes in health behavior can lead to significant reductions in morbidity and mortality rates (Ross et al., 2012). Yoga is a biopsychosocial system that is aligned with the foundations of occupational therapy and that can provide individuals with tools to prevent and combat chronic health conditions. The inclusion of yoga within the scope of occupational therapy practice can empower individuals to better self-manage their health and wellness behaviors and improve their quality of life. Participants for this study were purposively recruited, which may limit the generalizability of the findings. Notably, nearly all of the participants were White, educated women. This is similar to the findings of Birdee et al. (2008) and Ross, Friedmann, Bevans, and Thomas (2013), which suggested that although yoga may be beneficial for a number of populations, users of yoga in the United States are more likely to be young, female, college educated, and White. The language included in the open-ended survey questions could be considered directive, thus influencing participant responses. Additionally, because online platforms were used to recruit study participants and the surveys were anonymous, it is possible that bias may have skewed the survey results. When included in occupational therapy, yoga must be used in the context of an overall process and plan of care. This requires the occupational therapist to determine whether specific elements of yoga practice are congruent with the client's cultural practices, priorities, or needs and to ensure that they positively affect health, well-being, and participation in life (American Occupational Therapy Association, 2017a). When using principles of yoga within the occupational therapy process, practitioners are responsible for acquiring specific CHAIH knowledge and the requisite training and credentials needed to meet the standards of the AOTA Occupational Therapy Code of Ethics (American Occupational Therapy Association, 2015; American Occupational Therapy Association, 2017a). A good starting point to explore and share the range of benefits of yoga would be the moral and ethical guidelines outlined in the eight limbs of Patanjali's Yoga Sutra. Because occupational therapists value evidence-based practice, it is important to provide evidence that supports the use of yoga within occupational therapy. The use of yoga as an evidence-based approach to clinical practice would require research on the specific utility of yoga for populations with neuromuscular, cardiovascular, or mental health limitations. Research sometimes includes inconsistent definitions of yoga and variable explanations of the specific techniques used. Additionally, some methodological limitations, such as small sample sizes, randomization methods, withdrawals and dropouts, and details of yoga intervention, limit the conclusions that can be drawn (Birdee et al., 2009). Future research on the use of yoga as a complementary intervention within occupational therapy practice warrants higher standards for methods and reporting. With the vast history of yoga as a self-care strategy, its reported health benefits, and the philosophical similarities between yoga and occupational therapy, there is a need for further study of the role of yoga as a complementary intervention within the scope of occupational therapy. With increased knowledge of yoga, occupational therapists may be more prepared to suggest yoga to clients as a complement to therapeutic activity, refer clients to specific yoga teachers and therapists, or use elements of yoga as a therapeutic medium. Moreover, occupational therapists may be able to address physical, mental, or spiritual limitations for those who value yoga as a meaningful occupation. Ongoing research will help to validate the viability of yoga as a therapeutic option for occupational therapists to promote health, well-being, and participation in life. Bazyk, S. & Arbesman, M. (2013). Occupational therapy practice guidelines for mental health promotion, prevention, and intervention for children and youth. Bethesda, MD: American Occupational Therapy Association. Bryant, E. F. (2009). The yoga sutras of Patañjali: A new edition, translation, and commentary. New York, NY: North Point Press. Feuerstein, G. (2008). The yoga tradition: Its history, literature, philosophy, and practice. Prescott, AZ: Hohm Press. Iyengar, B. K. S. (1979). Light on yoga. New York, NY: Schocken Books. Kanmanthareddy, A., Madan, K., Manchanda, S. C. & Lakkireddy, D. (2016). Yoga therapy for heart disease. In Khalsa, S. B. S., Cohen, L., McCall, T. & Telles, S. (Eds. ), The principles and practice of yoga in health care (pp. 277–298). Edinburgh, Scotland: Handspring. Khalsa, S. B. S., Telles, S., Cohen, L. & McCall, T. (2016). Introduction to yoga in health care. In Khalsa, S. B. S., Cohen, L., McCall, T. & Telles, S. (Eds. ), The principles and practice of yoga in health care (pp. 5–16). Edinburgh, Scotland: Handspring. Kielhofner, G. (2009). Conceptual foundations of occupational therapy practice (4th ed.). Philadelphia, PA: F. A. Davis. Ross, A. & Michalsen, A. (2016). Yoga for prevention and wellness. In Khalsa, S. B. S., Cohen, L., McCall, T. & Telles, S. (Eds. ), The principles and practice of yoga in health care (pp. 471–484). Edinburgh, Scotland: Handspring. Schweig, G. M. (2007). Bhagavad Gita: The beloved Lord's secret love song. New York, NY: HarperCollins. Sovik, R. & Bhavanani, A. B. (2016). History, philosophy, and practice of yoga. In Khalsa, S. B. S., Cohen, L., McCall, T. & Telles, S. (Eds. ), The principles and practice of yoga in health care (pp. 17–30). Edinburgh, Scotland: Handspring. Taylor, M. (2012). Creating a biopsychosocial bridge of care: Linking yoga therapy and medical rehabilitation. International Journal of Yoga Therapy, 22(1), 93–94. 1. What motivated you to begin practicing yoga? 2. What motivates you to continue practicing yoga? 3. In what ways has yoga influenced your lifestyle choices? 4. How has yoga influenced your health and medical conditions? 5. In what ways would you like to see yoga incorporated into Western health care practices? 1. What is your definition of yoga? 2. In what ways do you incorporate yoga into your professional practice? 3. In what ways do you incorporate yoga into your personal practice? 4. What are some ways that yoga can help individuals to improve their quality of life? 5. What are the barriers to using yoga as a therapeutic intervention within occupational therapy practice? Dr. Graham is Acute Care Occupational Therapist, Swedish Medical Center–First Hill, Seattle, Washington. Dr. Plummer is Associate Professor, Belmont University School of Occupational Therapy, Nashville, Tennessee. The authors thank Karen Oberg, OTR/L, RYT, for her guidance and the faculty, staff, and students of the School of Occupational Therapy at Belmont University for their involvement in the creation of this project. This project was completed to fulfill Occupational Therapy Doctorate degree requirements at Belmont University. Address correspondence to Julia Graham, OTD, MFA, CYT, OTR/L, 7116 191st Place SW, Lynnwood, WA 98026; e-mail: juliaanngraham@gmail.com.